Get a detailed overview of Oracle Primavera P6 Enterprise Project Portfolio Management and manage projects from just anywhere using simple e-mail and the P6 iPhone app. 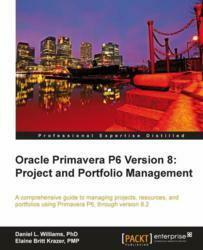 Packt is proud to announce the publication of Oracle Primavera P6 Version 8: Project and Portfolio Management, a book which would help manage your projects from just anywhere using simple e-mail and the P6 iPhone applications and help get a detailed overview of Oracle Primavera P6 Enterprise Project Portfolio Management. In 2001, Daniel Williams first began working with Primavera as part of an integration project with JD Edwards World. His work centers around helping people make best use of Primavera and other software investments.Daniel’s background includes a Ph.D. in Physics from Caltech, many years of programming in C, C++, C#, and Java. In 2003, Elaine Britt Krazer began working for a Government contractor in a Top Secret environment with Primavera products as a project manager. She has been managing projects since 1986 and embraces Primavera as her tool of choice.She is an Oracle Certified Primavera Implementation Specialist and is also Primavera Training Authorized. This book provides a detailed overview of Oracle Primavera P6, which would help the reader manage projects from any place using the e-mail and the P6 iPhone applications. It provides a detailed solution for managing projects of any size by adapting to various levels of complexities within a project. This book aims to show the readers all the features and functionalities of the software thoroughly and clearly. Comprised of two sections, the first section explores the fundamental concepts behind managing projects which include organizing projects, adding activities and relationships, assigning roles and resources, and scheduling a project. In the second section, the book covers the web client portfolio management that helps to work with portfolios, portfolio analysis, portfolio capacity planning, ROI, and tracking performance. Packt Enterprise is a leading publisher of Enterprise books for Oracle, Microsoft, IBM, SAP, Citrix and other technology companies. Packt Enterprise develops books for Architects, Developers, Administrators and End User alike.